Chinese President Xi Jinping, right, attends the Sustainable Development Summit 2015, Sept. 26, 2015 at United Nations headquarters. Rights group Amnesty International says that since President Xi came to power in late 2012, authorities have carried out “unprecedented attacks on civil society,” curbing freedom of expression, detaining lawyers and other rights activists. Chinese authorities say the country’s record on women’s rights is clear. “As long as you don't wear [rose] colored glasses and have an objective view, you will reach a fair conclusion about the important achievements women have made in China,” Foreign Ministry spokesman Hong Lei recently said. “Internationalizing China’s NGO's can facilitate a better understanding of the laws, policies, culture, communities and religion of different countries,” said Huang Haoming, executive director of government-backed China Association for NGO Cooperation, in a recent article. Having officially-backed NGO's in different parts of the world would enhance China’s political influence, analysts said. Eve, researcher at CHRD, also questioned the United Nations' decision to become a co-host in the conference, giving the impression that it approves of the reprisals on women activists in China. 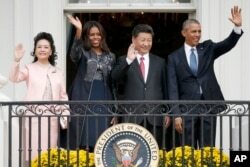 President Barack Obama, Chinese President Xi Jinping, first lady Michelle Obama and Chinese first lady Madame Peng Liyuan wave from the Truman Balcony of the White House in Washington, Sept. 25, 2015. Unlike in the past, China’s president and premier have wives who take an active interest in global issues. Xi’s wife, Peng Liyuan, is a famous singer who is associated with the World Health Organization and other international bodies fighting problems like AIDS. Spouses of past presidents and premiers have hardly ever been seen in public; but, Chinese activists said the new visibility has not helped to improve the overall condition of women. Sunday’s conference comes 20 years after China hosted a groundbreaking U.N. conference on women’s rights. Activists say that although the country has made some progress since then, passing laws on domestic violence and helping women make economic gains in the workplace, under the Xi administration, women’s rights have been hurt in the crackdown on civil society.